river mouth at Shoalhaven Heads was open in 1961, 1974-1980, 1988-1994, 1998-1999, 2013-2014 and 2015-2016. This work presents a series of surveys that started in the 1980’s and included repeated echo-sounding, LiDAR and RTK-GPS data to assess the volumetric change after the reduction in fluvial input imposed by the construction of Tallowa Dam in 1976.
m3 occurred between surveys. The estuarine area upstream of the confluence of Berry’s Canal accreted ~2,620,000 m3, whereas the lower end between Shoalhaven Heads and Crookhaven Heads eroded ~1,600,000 m3. 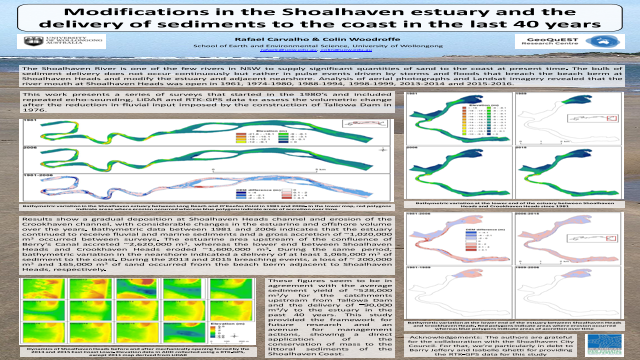 During the same period, bathymetric variation in the nearshore indicated a delivery of at least 1,065,000 m3 of sediment to the coast. During the 2013 and 2015 breaching events, a loss of ~ 200,000 m3 and 165,000 m3 of sand occurred from the beach berm adjacent to Shoalhaven Heads, respectively.